Inicio > Informática > Accesorios > Maletines y bolsas > Kensington Cover Stand / Ipad Mini - Red Accs . Kensington Cover Stand / Ipad Mini - Red Accs . 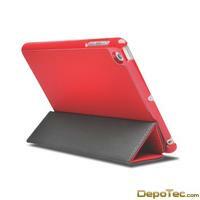 Imágenes: Kensington Cover Stand / Ipad Mini - Red Accs . Give your iPad® Mini a two-position stand and two layers of protection with the Kensington Cover Stand. Whether you’re typing emails or browsing the web, you’ll find that the two-position stand makes it easier and more enjoyable. One position is easier on your eyes for viewing videos, reading, and browsing the web—the other is easier on your hands and wrists for typing on the touchscreen. But improved productivity is only half of the story with the Cover Stand. That’s because it also wraps your iPad Mini in two layers of protection. The soft velvet interior protects your iPad Mini from scratches, while the hard shell exterior cushions it from the inevitable bumps and bruises. A device as small and sleek as the iPad Mini just begs to be taken with you wherever you go. And the Kensington Cover Stand makes sure you’re iPad Mini is protected on the go and more productive when you get where you’re going. The Cover Stand has a form-fitting design that adds no bulk and integrates perfectly with your iPad Mini, so it maintains access to all buttons, ports, and other features. It’s camera ready too.